Healthy, beautiful smiles through orthodontic treatment. A beautiful smile doesn’t last without proper bite correction and tooth alignment. That’s why our orthodontic office specializes in treating the complete chewing system. We believe that proper alignment is important, not only from a cosmetic point of view, but also a healthy chewing system is important to the longevity of your smile. Your chewing system is made of several components including your jaw joints, the associated muscles and your teeth. In a healthy chewing system, these elements work together favourably, so your teeth meet evenly when you close your jaw with your jaw joints properly aligned. Click the picture to enlarge the animation. 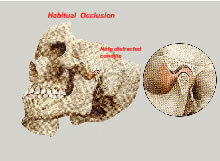 An unhealthy chewing system (shown) involves an unfavorable relationship between the jaw joints and the teeth during closure. If your jaw joints are not aligned properly, your teeth may not fit together perfectly, often resulting in clicking sounds and joint deterioration. 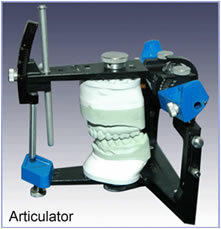 To correct your bite, Dr. Bianco mounts models of your teeth on an instrument called an articulator (shown). The articulator is indispensable in studying the relationship between the teeth and the jaw joints. It allows Dr. Bianco to review how the teeth and bite interrelate. A treatment plan can be customized based on these findings. The result is a beautiful smile and healthy, stable jaw joints. Is your smile the best it could be? To find out, contact us for an appointment.